Recruit fantastical races–engage in fierce battles–complete dangerous quests–conquer exotic kingdoms–make yourself ruler of Myrathia! WarQuest is a high fantasy/grand strategy game that immerses players in the world of Myrathia where each takes the role of a warlord seeking to reunite the fractured land under his/her banner. 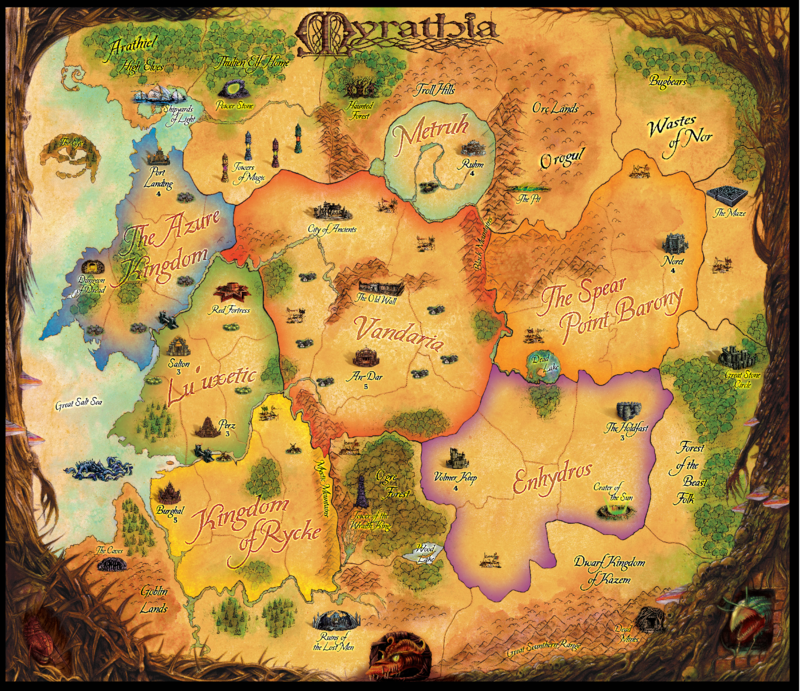 During the game, players will recruit different races (wood elves, dwarves, goblins, orcs and satyrs) to fill their armies, travel across the world of Myrathia, complete demanding quests, engage in ferocious battles, conquer and control strategic regions, and if successful, make themselves ruler of all Myrathia. The game is for 1-5 players and takes 45 minutes to an hour per player. WarQuest is firmly rooted in the theme-driven, dice rolling, engaging fun of big box “Ameritrash” map and miniatures games combined with the advantages of newer gameplay mechanics and concepts that facilitate faster, more balanced and more dynamic gameplay. WarQuest miniatures are in 25mm scale (the warlord and lieutenant are 25mm foot to eye and some races are larger (orcs) and some are smaller (dwarves and goblins). The miniatures are made by the same team that made the miniatures for Zombicide and Arcadia Quest. WarQuest reunites, for the first time since 2006, the design, development and production team that brought you Railroad Tycoon™ the boardgame, Railways of Europe, Conquest of the Empire, and Age of Empires III™ the boardgame. In addition, Ralph Horsley (Lords of Waterdeep, Shadows of Brimstone) is doing the cover, creature races and character art. Don Beyer (Bootleggers and the upcoming Extraordinary Voyages) is writing the rich Myrathian history. Check out this fun behind the scenes video with team members of WarQuest! “We’re gonna need a bigger table.